its is surely the stand out street in the City Centre... I am all for development and progress... but Womanby Street should be preserved.. can it have a protection order? Anyone have an image of the building they want to knock down? Looking at the planning docs linked on the previous page the building being demolished is no loss and the plans are quite sympathetic. I do believe that it is wrong to shut down businesses/ make them un-viable just because new accommodation has been built near by to an area who's purpose it to provide this kind of entertainment. Maybe a caveat on the development and the proposed Weatherspoons hotel should be that there is going to be late night noise on this street, though i dont know how this could be effected as there should be no outside noise after 23:00pm and there are large fines for this. I thin there is a difference though between noise directly caused by a venue ie music, and noise from people in the street, for example the brewery quarter apartments. There are precedents for caveats on planning permission in England but I believe these wouldn't apply in Wales under the present law. Oh and the John St and halfish in view hope street towers will make it look very impressive for a medium size uk city! Bridge St will be obscured in that view, but it will add some density to the clusters. The Captial Quarter developments (two towers) and the John St will really add a lot! With Custom House and the Brains Site redevelopment, we might start to get a proper skyline! The plans also include a Maggies Centre. The proposal is that the existing Velindre will be decommisioned in 2022 and presumably the land sold for housing. It's difficult to envisage what it will look like as at this stage as the drawings are indicative only. However the principle is one I wholeheartedly support. Centres of excellence like this form a virtuous circle. Having a number of highly skilled and motivated practiotioners and reserachers in state of the art surroundings attracts others who want to be at the heart of cutting edge science. 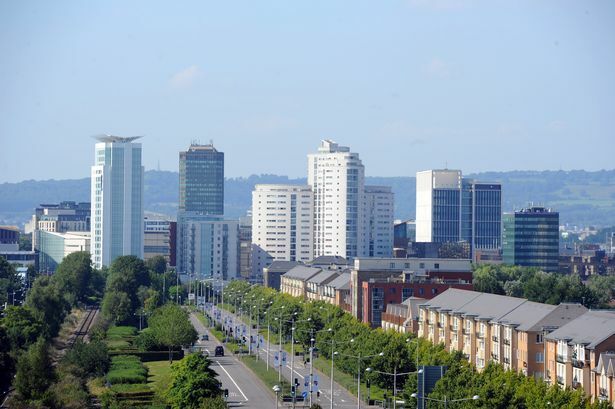 Cardiff already has a good reputation in cancer care and this development will enhance that reputation further and hopefully lead to improvements in cancer care and outcomes. Peiriannydd wrote: Bridge St will be obscured in that view, but it will add some density to the clusters. The Captial Quarter developments (two towers) and the John St will really add a lot! Re Bridge Street... We'll have to see, but I'm thinking it should be somewhere behind the Big Sleep - and looking quite substantial! The Herbert Street and Capital Quarter towers will have a huge impact on that view. Hopefully the John Street tower will eventually come through too! Also, Bridge Street is quite a bit taller than Admiral HQ so will still make a mark on the skyline from that angle. It looks like the redevelopment of the crappy brown brick building in Church Street is about to kick off. There is a sign in the window of Atma Street Food saying they will be closing on 15th April and relocating due to the building being redeveloped. From memeory the proposed new building wasn't fantastic but was very much an improvement on the current one.